The goal of your initial visit to our office is to determine if orthodontic treatment is necessary and, if so, when it would be appropriate to start. The first visit is complementary and consists of an office tour, a clinical examination, digital x-rays (if necessary), initial diagnosis, and a discussion of potential treatment options. If the examination reveals that treatment is warranted, an estimate of treatment cost and determination of insurance benefits are reviewed. If it is decided that the patient is ready for treatment, comprehensive diagnostic and consultation appointments are made. The initial exam is a great opportunity to ask any questions you may have for Dr. Daub. He is easy to talk to and very knowledgeable. Comprehensive diagnostic records (x-rays, pictures, and plaster or digital models of the teeth made from the impressions) are thoroughly analyzed by Dr. Daub to determine the best course of treatment and to develop an individualized treatment plan. We discusses your treatment plan in detail and appointments are set to place orthodontic appliances. Placement of orthodontic appliances (braces, expanders, etc.) usually takes from one to two hours. You will then see us at regular intervals, four to eight weeks apart, for adjustments which take approximately 20-30 minutes. Patients are seen by appointment only. We make every effort to be on time for our patients, and ask that you extend the same courtesy to us. If you cannot keep an appointment, please notify us immediately. When treatment is completed, the braces/appliances are removed and post-treatment records are taken. Retainers are made and fit to hold the teeth in place. The cost of treatment depends on the severity of the problem. You will be able to discuss fees and payment options before treatment begins. We have payment plans to suit different budgets. We also accept assignment from most insurance plans, and file the necessary paperwork with the insurance company. If you have orthodontic insurance, we will help you to determine the coverage you have available. 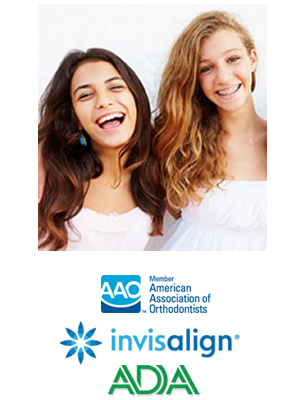 We work hard to make orthodontics affordable.